This week I had the opportunity to sell two different clients two lenses that will be used for different purposes. The first is a black iridium radarlock pitch SKU# 43-547 lens, and the other is the polarized version SKU# 41-770. What made me write this post? The questions that the customers asked made these two purchases very interesting. It was just pure luck that both customers ended up with these two almost identical lenses in the same week, but Singaporean’s tend to be lucky so this shouldn’t come as a surprise with the year ending, with everyone looking at their holiday plans and starts thinking of what equipment they need to pack. So why one decided on the polarized and the other didn’t? The polarized was bought by a lady, who is awesomely fit, and told me she was about to go on a mountaineering trip to Nepal. Lots of glaring snow at 8000m, she has snow goggles for the tough days but wanted a shield RadarLock for those days where she won’t need uncomfortable goggles but yet provide a lot of protection from the sun. When you are from sunny Singapore, RadarLocks are usually equipped with Path lenses but when you are in snow conditions (Singaporeans are definitely fishes out of water when it comes to snow), path lenses has a drawback. Light comes from everywhere when you are so high up where everything is covered in snow. Especially light reflected from the ground, like a Forrest Gump movie where rain comes from everywhere in Vietnam. At 8000m, with very little atmosphere to cut out UV rays and high glare snow, your eyes will feel very strained within minutes and very uncomfortable within an afternoon. Lenses needs to be Category Four, blocking out at least 90% visible light transmission (VLT) and since she has dark brown asian eyes, she doesn’t need lenses that block more light than that. As for shape, RadarLock Path lenses are cut higher up the cheeks and if light comes from the ground, does not cover properly and lets in light and glare from the snow. For Singapore, there will never be a problem like this. 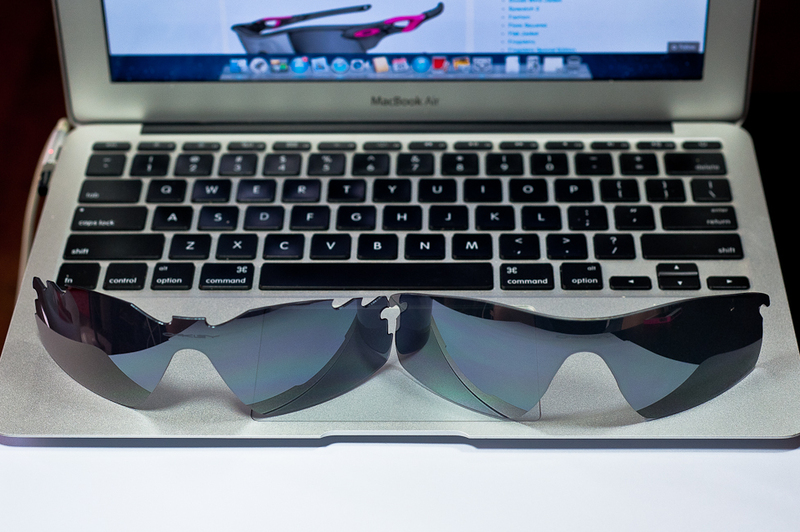 The Pitch lenses does a better job at protecting your eyes with a broader lens and better coverage at the bottom. This stops the glare from the snow as well as the sky. Now why polarized? Polarization is not ideal in snow conditions as it makes it hard to spot ice from snow. But again, she’s going to use the RadarLock’s for the easy days so this shouldn’t be a big problem. What polarization does is get the tinting darker, which you can see in the two photos below. Dark tinting of Black Iridium Lens at 90% visible Light transmission. Darker tinting of Polarized Black Iridium Lens at 91% visible Light transmission. The polarized version is only 1% darker than the non polarized, but there is a big difference in darkness. (disclaimer: no photoshop is done on the photos and they are taken 5 seconds apart in studio conditions) and this small difference will be magnified when the intensity of the light grows as the photo is showing light coming from a computer screen and not the actual sun itself. 1% of sunlight equates to a more comfortable day, especially when your iris is shuttered down to its lowest diameter and the only other way of stopping light is those lenses. So what about the customer that chose the Black Iridium Pitch? Simple. Because the Black Iridium is just as good. At a lower affordable price point. The Singapore sun doesn’t overcome these lenses and torture your eyes one bit at 90% VLT. 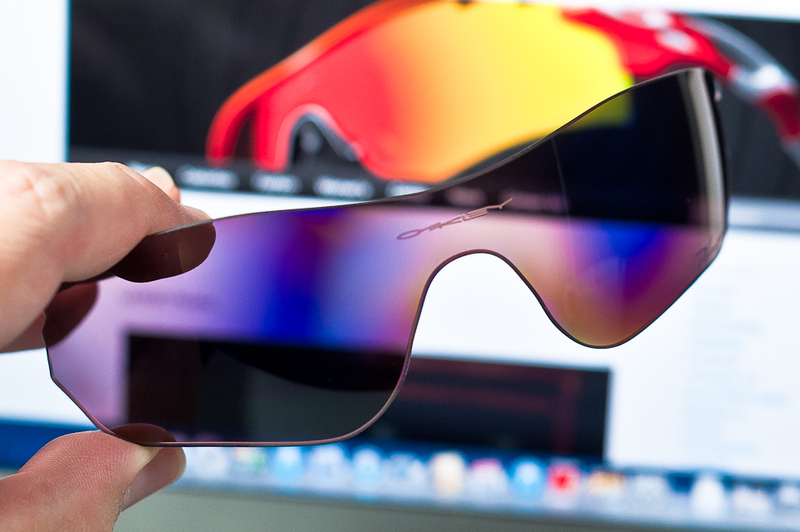 It is still 100% UV block like all other Oakley lenses. He uses these lenses for sports and driving. So, one good thing about non polarized lenses are that they don’t make those trippy, flower power, 1970’s color shifting that the polarized version does. It can get disorientating when you are wearing polarized lenses and looking at screens on your handphone or the LCD displays in your car as you can’t really see what the display says. It also does the same thing to cars passing by, or shiny objects that lie at the periphery of your vision. OO Grey Polarized RadarLock goes trippy and shifts colors on a computer screen. So moral of the story. Lots of people ask me for polarized lenses. Yes, they do make things clearer, cuts down glare better and does a better job at lowering VLT. But in Singapore, the non-polarized lenses are just as good. Of course, if you do need the polarized version specific to your job or sports, engineering a set of shades that includes polarization to fit your needs are the most important bit to creating an environment for you to excel in. Losing focus when the sun becomes overbearing and your eyes gives up on you, that’s where the danger lies.